The Stanford Festival of Iranian Arts, and the Bita Daryabari Endowment in Persian Letters. 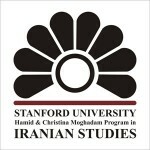 The Stanford Festival of Iranian Arts organizes conferences, screens films, and sponsors plays and exhibits that highlight Iran’s modern arts. The Festival is supported by Bita Daryabari, the Amin Banani Memorial Fund, and Hamid and Christina Moghadam.